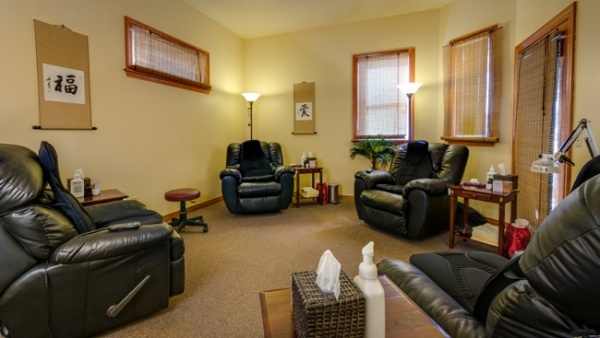 All of the leather recliner chairs at each Cascade Acupuncture Center location have massage and heating pads. Additionally we have Zero Gravity recliner chairs which have heated Jade Crystals and massage, check out this video. Ambient, relaxing music is playing in all treatment rooms. Each recliner chair features a call button, in case a client needs to reach our staff. Many people, especially the elderly or those with painful conditions report being more comfortable in recliner chairs than on a massage table during their treatments. Some clients fall asleep! These treatments are more deeply relaxing and lead to better results per client testimonies. The increased effectiveness is attributed to the “Community Energy” that is created when multiple people receive individual treatments in the same room. This setting also enables clients to come to treatments together with their spouses or friends and share a healing experience! Some couples have called it “going on an acu date”! A private consultation room is available to discuss your medical information. We also offer Individual treatments in private rooms on a massage table in each of our clinics. They are always scheduled on the top of the hour. Please feel free to ask us if we have a private treatment room available, even if your appointment is not on top of the hour.